The Spike Video Game Awards show is coming, and three big announcements from BioWare, Remedy Entertainment, and Konami are coming with it. 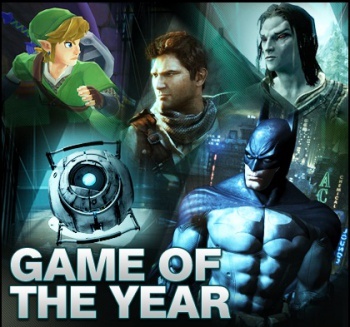 Say what you will about the Spike TV Video Game Awards, but they're hardly the best representation of gaming culture. A decreasing viewership coupled with a very narrow view of the industry and its demographics have not done much to help its case. However, some really cool stuff came out of the show last year, and Spike is looking to recreate its success with three new announcements this year. If you tune into the 2011 VGAs, expect to see details about a new BioWare project, an Alan Wake follow-up, and peek at an upcoming Metal Gear title. A press release from Spike outlines the basics: "Guests include legendary game designer Hideo Kojima who will reveal the truth about "Metal Gear Solid: Rising" with a spectacular world premiere, the announcement of a new project and new studio from BioWare, creators of Most Anticipated Game of the Year nominee "Mass Effect 3" and the return of XBOX hero "Alan Wake" in an all-new adventure." The Metal Gear and Alan Wake teasers seem straightforward enough, but it's not clear whether BioWare intends to announce a new installment in an existing series, or a whole new IP. Further information will follow in December's issue of GameInformer. Fans of the previous year's coverage will be pleased to know that Spike will continue its bizarre tradition of selecting the coveted "Game of the Year" from titles that have yet to surface. While many gamers are probably well-equipped to select between Arkham City, Portal 2, and Uncharted 3, Spike has yet to explain how most people could cast a conscientious vote for Skyrim or Skyward Sword in advance of their releases. Other popular titles, like Assassin's Creed: Revelations and Dark Souls, do not appear at all. Spike may not have the best practices for choosing 2011's best game, but if last year's trailers are any indication, the announcements alone may be sufficient reason to tune in. The VGAs will air "in over 100 countries and territories" at 8:00 PM EST, December 10, 2011 on Spike TV and MTV2. In the meantime, The Escapist recommends you work on developing clairvoyance in order to cast your GOTY vote in the most educated, unbiased manner possible.